– May 11, 2012Posted in: Poppy Appeal & Charity Support, The Premiere! After each screening we had a retiring collection to raise funds for two charities which Anna chose due to their amazing work supporting war heroes from WW2 to the present: The Poppy Appeal and Help for Heroes. We raised a fabulous £923 to be shared between them and we will be continuing to support their important work. 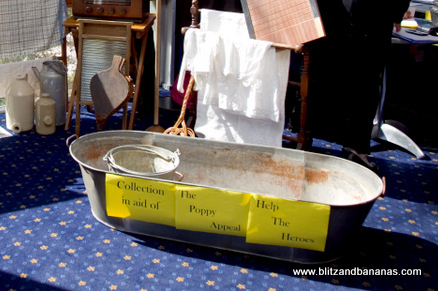 Thank you to some of the actors from the film who donned their WW2 uniforms to collect donations in their tin buckets and even a tin bath! Thank you so much to all of you who gave so generously. It was also a privilege to have with us on the day some WW2 veterans, including some who had been Prisoners of War. We admire you greatly and deeply appreciate what you did for us and for our country.